Hyderabad | National saving Prize Bond Lucky Draw Rs. 200 was held on Dated 17 March 2014 in Hyderabad. This Draw Prize Bond Result 200 Rs Hyderabad 17th Mar 2014 was lucky for whom who have some lucky numbers for their life. 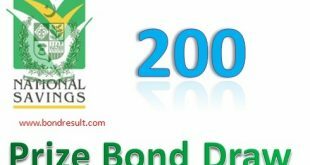 Quetta (16th of June 2014) : National Savings of Pakistan is going to declare Rs.200 Prize Bonds Draw Monday June 16, 2014 held in Quetta at 09:00 AM.